As the midrange offering to Samsung’s 2016 line-up, the UE49KU6400 has an expectation to be a popular household favourite. Fortunately, this is the first sign that quality doesn’t have to cost the earth, as the picture technology and feature-set included allows this gorgeous 4K Ultra HD TV to punch far above its featherweight price tag. The most notable aspect of the UE49KU6400 is the generously-sized display panel. Measuring in at 49 inches, it can occupy most rooms confidently without overcrowding them in the process. It’s beautifully slim too, with an off-stand depth of only 55mm, making this a superb choice for wall-mounting. The whole design is sleek, modern and understated, exuding a definite level of quality that has been missing from mid-range televisions for some time now. 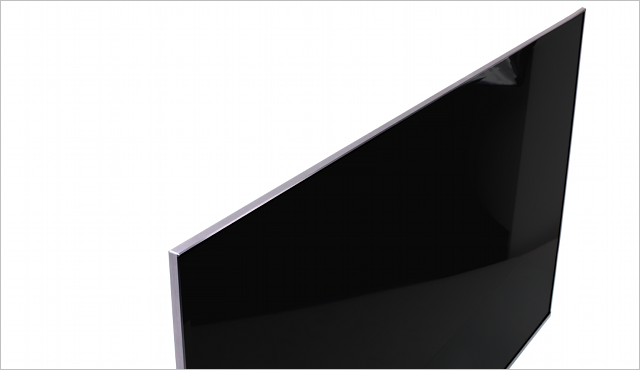 The stand was an initial niggle, with 4 legs supporting the screen over a more popular flat base plate, but after spending more time with the UE49KU6400 we feel it complements the overall design superbly, in keeping with the slim profile of the television itself. The most important aspect of any prospective television, how does the Samsung UE49KU6400 pair up against the competition? Well, you get a fully-fledged 4K Ultra HD resolution display – four times the pixel density of Full HD – that has a number of picture processing technologies and high dynamic range (HDR) capabilities. Considering the modest price, we’d say it holds up very well indeed. Picture quality has been superb in all of our tests. Images on-screen were crisp, vibrant and bursting with character – the kind of quality we’d expect from a much more expensive television. Support for HDR content is a sure sign that the UE49KU6400 has a wide colour and brightness palette as there is a minimum specification that must be met for HDR content to be accurately displayed. Blacks are impressive and believable, whilst whites are incredibly bright – HDR Ultra HD content is the absolute pinnacle of quality and this Samsung TV delivers with aplomb. We did find that in certain high-speed scenes motion blur became apparent, but it was reduced drastically with a little tweaking, delivering a responsive and stable image. There’s going to be a lot of time when you aren’t watching Ultra HD content, especially while the format continues to mature. Fortunately, Samsung’s UHD Upscaling technology helps to provide an edge to any sub-4K quality content that you watch on the UE49KU6400. Mileage may vary depending on what you watch, but we found that most things were given a noticeable boost in clarity and overall quality levels. The process happens automatically and really doesn’t have a downside, so it’s just a nice addition to further emphasise the superb set of features on this model. Finally, gaming performance. We used a Leo Bodnar Input Lag Tester to measure how well the UE49KU6400 would stand up to intense gaming. While Game Mode was enabled (which we highly recommend when using this TV for video games) the UE49KU6400 exhibited only 19ms of input lag, making this one of the best televisions we’ve seen for gaming in quite some time. Input lag rose to 112ms when tested with other picture modes, so make sure to activate the Game Mode picture setting when firing up your game of choice. It’s obvious that concessions were made to keep costs to a minimum and it shows here. The two down-firing 10w speakers combine to create the overall 20w output, which delivers competent mid-range performance but begins to struggle with more complex soundscapes. Bass, in particular, is often lacking, meaning that any movie buff will want to invest in a quality audio system to support the UE49KU6400. 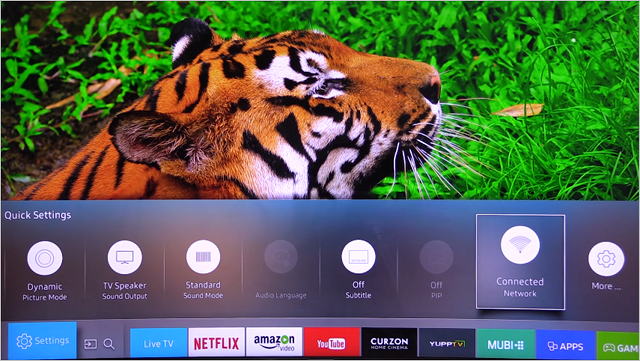 Fortunately, most modern audio systems will work seamlessly with this Samsung TV, ensuring you have plenty of options to give the stellar picture suitably stellar audio in support. The Tizen-powered Smart Hub from Samsung has gone from strength to strength in the past few years, even rivalling that of LG’s webOS interface. The Smart Hub is quick, intuitive and has a wealth of options to give you total control over your experience. You’ll find everything you’d expect from a quality Smart TV platform – apps from top on-demand providers, such as Netflix, Amazon Video and YouTube, along with the impressive cloud gaming capabilities courtesy of GameFly Streaming. The interface can be customised to your desire, so you’ll be able to create a personalised space for easy access to the things you care about. We took the Smart TV platform a spin and found it to be stellar, improving on our living room TV experience by a great deal. Having such quick access to on-demand content and internet browsing was a real game changer. Better yet, the powerful quad-core processor ensured that performance was always superb and the interface never felt sluggish or unresponsive. It was visually appealing and felt natural as we navigated through the various menus. Connectivity wise, the UE49KU6400 has all the essentials to ensure that all your favourite peripherals can be connected for a full home cinema experience. HDMI, USB, Digital Audio Out, Anynet+, Component and Composite are all available for direct connections to your various devices. Furthermore, both WiFi and Ethernet are included to allow for simple connection to the internet – perfect to make the most of the Smart TV features. It’s equipped with everything we’d expect from a modern television in 2016, though there is a distinct lack of SCART support, so older consoles and set-top boxes might need to be upgraded when you make the switch. It’s difficult to argue against any TV that boasts 4K Ultra HD resolution, HDR quality visuals, an industry-leading Smart TV service, and a number of additional bells and whistles, but when you consider the price of the UE49KU6400 it becomes a no-brainer - even with a huge range of other 4K Ultra HD TVs to choose from. This is easily one of the best value propositions available for anyone looking for a model that ticks all the boxes – the latest technology for a future-proofed viewing experience and a well-sized screen for most homes. The Samsung UE49KU6400 is an absolute knock-out success that we’d heartily recommend to anyone looking to bring 4K into their home. 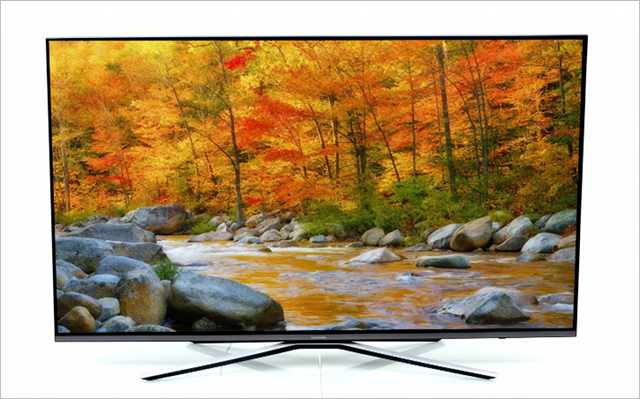 Purchase the Samsung Series 6 UE49KU6400 4K Ultra HD 49" Television from Marks Electrical today.